Turn the worst lawn into the perfect picture. 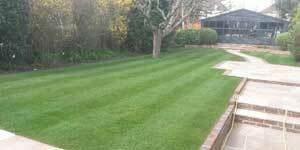 TruGreen can turn the worst lawn into the perfect picture. By investing in our turf replacement service we can transform a lawn that you may well believe is beyond repair into the most aesthetically pleasing turf that will make you the envy of your neighbourhood. Our turf supplier is one of the largest commercial producers of quality turf in the UK, and can supply turf for hard wearing lawns for you and your children to enjoy, through to ornamental or shade tolerant varieties for those of you who wish to sit back and enjoy the view. These before and after photographs show the benefits of instantly replacing a lawn, which transforms the garden from the picture on the left into the most perfect of garden view. 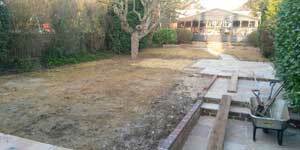 Lush well established turf that can be used for the enjoyment of the whole family as soon as the job has been completed. The transformation between the two pictures above was completed within two working days and as well as creating a perfect lawn we will take care of removing all waste materials, guaranteeing that all pathways and surrounds are washed down before we leave.